It has been a long year for the Rangers, as they have really not been winning much. They have already begun selling prior to the trade deadline, sending Cole Hamels to the Cubs, and placing their top three relievers on the block. The Astros on the other hand have had a perfect season. They have a dominant offense, to pair with the best pitching staff in baseball. What could be better for them? It’s been a long year for the Rangers. While they have gotten nice run production from Jurickson Profar, Joey Gallo, and Nomar Mazara, the wins still have not been coming. Shin Soo-Choo has also been hitting well, but in the AL’s most competitive division, the Rangers are rotting in last place. They’ve been outscored by 86 runs this year, and haven’t had a pitcher come through consistently for them with wins. Life as a Rangers fan is not one that people should want to have right now. Oy. The Rangers will send Mike Minor to the mound for his twentieth start of the season. In 104 1/3 innings of work, Minor has recorded 84 strikeouts to go along with 25 walks. He has an ERA of 4.83. In his last start against the A’s, he allowed two runs on four hits over five innings. Where to begin with a team that has no weak link? The Astros, for the second year in a row, have been absolutely unbelievable. From Alex Bregman to Jose Altuve to George Springer, this team just has so many guys that can come to the plate and clobber the ball. On the other side, Justin Verlander, Gerrit Cole, and Charlie Morton have been among the best pitchers in all of baseball. The addition of Cole has helped put them over the top, while Morton has had a career year. A repeat as World Series champion will not be easy with the Red Sox and Yankees lurking, but it’s sure viable for these guys to do it again. Lance McCullers will take the mound for his 21st start of the season. He has gone 10-5, posting a 4.01 ERA in 116 2/3 innings of work. He has struck out 122 batters, while walking 48 and is only the #4 starter in the rotation. In his last 8 1/3 innings of work (over his last two starts), McCullers has allowed 11 runs on 10 hits. He has to improve today. 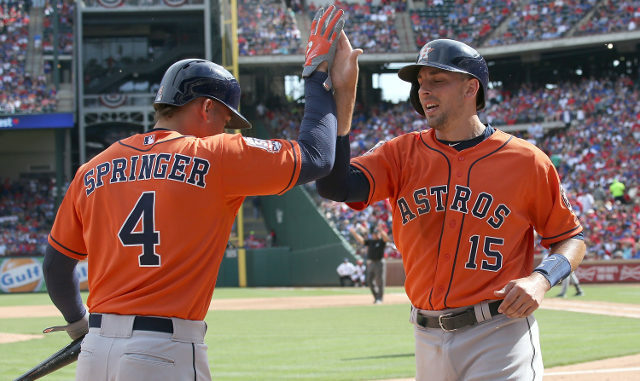 It’s almost impossible to bet on the Astros on a given night, and this one is no different. Lance McCullers will bounce back and bring his ERA back below 4.00, while the bats come alive. Evan Gattis goes deep twice in this game, and keeps the Astros rolling. The Rangers won last night and Rougned Odor may have had an inside-the-park home run last night, but that is ancient history.